Initial HE Shell Velocity812 m./s. 127 mm/25 Mk278 х 1 pcs. 20 mm Oerlikon Mk208 х 2 pcs. 40 mm Bofors Mk16 х 2 pcs. 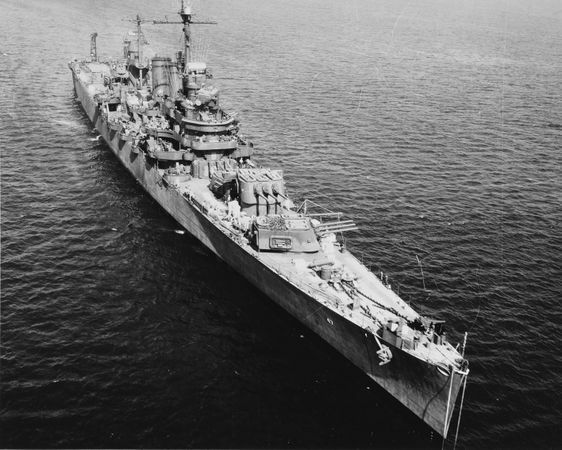 Boise — American promo premium Tier VII cruiser. A Brooklyn-class light cruiser built for the US Navy. Her main battery consisted of fifteen rapid-fire 152 mm guns. In the 1940s, the cruiser carried numerous automatic AA guns. Boise has many similarities to Tier VII American tech tree cruiser Helena. Comparisons between the two ships are well-earned, given that the two classes are closely related in American light cruiser design and development in the 1930's; anyone used to playing one of them should find the other a comfortable fit as well. There are a few notable differences between the two ships, however: Helena, for instance, has a kilometer more of range on her main battery guns, while Boise gains access to a Repair Party ( ) consumable. These aren't the only differences between the two ships, though, they are simply the most notable. Boise isn't a frontline ship, no matter what her Repair Party ( ) consumable alludes to. She is a close cousin of the American light cruiser branch, in no small part due to her association with Helena. Like many of the ships in that line, she does not take well to being shot at. Her armor simply isn't adequate protection against battleship shells, and even cruiser shells chew through her health pool all too quickly. As a result, any health regained through the Repair Party ( ) consumable can quickly be lost again. Captains should take care to minimize Boise’s exposure to the enemy team through careful positioning and map awareness; however, keeping Boise away from harm's reach can be difficult due to her short main battery range. While her 13.6 km range is better than Atlanta’s 11.1 km base range, it falls somewhat short of Helena’s 14.6 km. The issue of engagement distance can be somewhat mitigated by Boise’s high explosive shells — which can be a bit of a double edged sword due to their high arcing, low velocity nature. On one hand, it's easy to lob the the shells over islands and onto enemy ships, since they go into low earth orbit after being fired. On the other hand, these shells take a long time to go up and come down, making it difficult to lead enemy ships that are actively maneuvering with such low velocity ordinance. It is noteworthy that Boise’s guns almost require the Inertia Fuse for HE Shells skill in order to dish out good damage with her HE shells. With the skill though, full salvos of her high-explosive rounds can be devastating. With only 30 knots of speed to work with, Boise can feel frustratingly slow and shouldn't be relied upon to change positions very quickly. She also handles rather sluggishly, with a large turning radius to go with her lower-than-average speed. These issues are only exacerbated when comparison to Helena. Boise sacrifices speed, main battery range, anti-aircraft firepower, and handling quality in order to gain access to her British-style Repair Party ( ). Captains should think carefully about this ship's trade-offs, and must decide for themselves if they can make good use of the tools offered by the ship. Armament is comparable to Tier VII American cruiser Helena, but turret traverse is faster. Massive broadside firepower; landing most of an HE salvo on an enemy ship can do a significant amount of damage. Access to British-style Repair Party ( ) gives her excellent survivability for a Tier VII cruiser. Three rear facing turrets allows for effective kiting tactics. Poor forward turret angles and high shell arcs. Slow for a Tier VII cruiser, with a large turning radius. Short main battery range (even shorter than Helena). Requires the Inertia Fuse for HE Shells commander skill to make her guns truly effective against other cruisers and battleships. Slower main battery reload speed and weaker AA suite than Helena. As a premium ship, Boise doesn't have any upgrades to research. Slot 4 provides two viable upgrade options. Most captains will find Steering Gears Modification 2 ( ) useful for increased maneuverability. Captains who prefer to use islands as cover will likely prefer Propulsion Modification 2 ( ) in order to reposition more quickly, if spotted. Key skills for Boise commanders include the regular set of skills for light cruisers; priority being on Inertia Fuse for High Explosive Shells and Concealment Expert. Superintendent is also valuable for the additional Repair Party ( ) consumable. Mounting premium versions of these consumables is recommended to decrease their cooldown timers. Boise has the choice between the Defensive AA Fire ( ) and Hydroacoustic Search ( ) consumables. Defensive AA Fire ( ) is useful against enemy aircraft while Hydroacoustic Search ( ) can be used to screen for torpedoes or enemy ships in a nearby smokescreen. 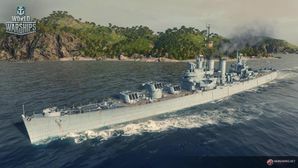 Captains should note that Boise has access to a version of Repair Party ( ) that is similar to what is found on high-tier British cruisers; it can potentially return as much as 40% of her base health with a single use. As a premium ship, Boise comes included with Type 10 camouflage that lowers her detection radius, reduces the accuracy of incoming shells, reduces her repair costs, and increases the amount of experience she earns. Boise is a light cruiser, meaning that most cruiser signals will work for her. Players may want to use signals to boost the fire chance ( ), consumable cool down ( ), and heal amount ( ). As a premium ship, players may also want to use economic signals, but her nation limits captain training abilities. In-game render of Boise in the MS 1 camouflage. This paint scheme is not in the game. USS Boise (CL-47) off San Pedro, California, 14 September 1945, following overhaul. After the London Naval Treaty in 1930 restricted the construction of "heavy" cruisers, the navies of Japan, Great Britain, and the United States started looking for alternatives which would combine similar strong firepower without violating the treaty. The solution was found in so-called "light" cruisers. Instead of maintaining their predecessors' focus on larger main battery gun diameters (typically 203mm), light cruisers would attempt to cram large quantities of smaller (150-155mm) barrels into hulls featuring improved armor protection. In Japan, this led to the Mogami class, armed with a heavy torpedo armament and five triple 155mm barrel turrets (though these ships would later be converted into heavy cruisers with 203mm barrels instead). The Royal Navy began development of what would become the Town class, also featuring a torpedo armament as well as twelve 152mm guns in four triple turrets. By this time, the United States had dropped the idea of a torpedo armament aboard their cruisers (excluding the later Atlanta class, which would fill a special role). Though the Pensacola-class cruisers were built with torpedoes, they were removed from all vessels of the class during refits in the 1930's. Thus, the Brooklyn class was not intended to carry torpedoes, focusing on other aspects of the cruiser's perceived role. Five 152mm triple-barrel turrets, mounted along the center line, formed the primary armament. Compared to the armament of the preceding Omaha class, the firepower the Brooklyn class was staggering; the Brooklyns had almost twice the firepower in a broadside, and the improved shells helped ensure better damage-dealing and penetration. The secondary armament consisted of eight (8) single-mounted 127mm guns, which could also be used against aircraft. Eight .50-caliber machine guns were added to provided close-range AA defense. The armor protection was vastly improved compared to the older light cruisers, with a 127mm thick belt protecting the vital areas of the vessel and a 51mm deck over the citadel. The steam turbines could pump out nearly 100,000 shaft horsepower, which allowed for a design speed of 32.5 knots. Unlike all preceding American cruisers, the aircraft facilities — including the hangar and the catapult(s) — were moved to the stern of the ship, with the hangar being a part of the ship’s hull. This freed up a lot of space amidships, which would later be used for additional armament. The ship’s displacement upon completion was 9,767 tons standard (12,200 tons fully loaded). The Brooklyn-class cruisers were, thusly, legal by the terms of the London Naval Treaty and were, unlike their Japanese counterparts, not overweight. With the attack on Pearl Harbor forcibly demonstrating the need of strong AA defenses on warships, the US realized that the anti-aircraft armament on most of their ships was insufficient. However, as the famous 40mm Bofors had yet to enter service in the quantities needed, stop-gap measures were deemed acceptable. These included installation of the 28mm "Chicago pianos", and even some older 76.2mm guns. It was not until late 1942 when the ships of the Brooklyn class started receiving equipment that could provide the AA firepower envisioned by their designers: twenty-eight (28) 40mm Bofors cannons, plus an additional twenty (20) 20mm Oerlikon guns (with the dual-purpose 127mm armament remaining unchanged). USS Boise (CL-47) was laid down at the Newport News Shipbuilding and Drydock Company in Newport News, Virginia, on 1 April 1935, launched on 3 December 1936, and commissioned into the United States Navy as the second-to-last Brooklyn-class cruiser on 12 August 1938. Boise’s shakedown cruise took her to Liberia and South Africa along the western coast of Africa, after which she transferred to the Pacific, where she operated between the US West Coast and Hawaii until November 1941. On the day of the Japanese air raid on Pearl Harbor, Boise found herself in the Philippines, in danger of being surrounded by Japanese warships. Boise made a hasty voyage to Darwin, Australia, where she joined up with the light cruiser USS Marblehead (CL-12) and five Clemson-class destroyers. She escorted a Dutch transport ship carrying supplies to the Dutch East Indies in January 1942, but in a twist of fate, on 21 January 1942, she struck an uncharted shoal and she had to return to Ceylon, then India, then finally the US for repairs. The mishap may have saved her from the fate that befell many Allied ships in the battles around Java. Her repairs were complete by mid-June 1942, and she was back at Pearl Harbor by early July. Her next mission was a dangerous one: a raiding cruise in Japanese waters, intended to cause enough confusion and chatter to cover up the Allied preparations for the Guadalcanal campaign. Departing Pearl on 27 July, she arrived at her raiding destination on 5 August, and completed her mission by the 8th (which was considered an success). Next, she covered the landing of Marine reinforcements on Guadalcanal in mid-September, supporting the mission she helped cover up. Her first battle came on the night of 11 October 1942. Alongside three other cruisers and five destroyers, Boise encountered three Japanese cruisers and two destroyers, and the Battle of Cape Esperance began. During the battle, Boise took multiple hits, but she answered with vicious volleys of fire, discovering the Japanese destroyer Fubuki less than a mile away. Her fifteen six-inch guns quickly crippled the Japanese destroyer, and she began to sink shortly after. Boise’s most damaging hit came from the cruiser Kinugasa, whose eight-inch shells struck the magazine between her 'A' and 'B' turrets. The hit caused a fire to erupt as her lower levels flooded, putting all 3 of her forward turrets out of action. Boise quickly retreated from the action to lick her wounds, eventually returning to the Philadelphia Navy Yard for repairs that lasted from late November 1942 until the 20 March 1943. On 8 June 1943, Boise sailed for the Mediterranean, arriving at Algiers on the 21st. From July to mid-August, Boise provided fire support for the Battle of Gela during the Allied invasion of Sicily, code-named Operation Husky. Following the successful invasion, she moved on to support the mainland landings at Taranto and Salerno during early September. She returned to New York on 15 November, then sailed for the South Pacific, arriving in south-eastern New Guinea on New Year's Eve 1943. From January to September 1944, Boise fought along the northern shoreline of New Guinea, providing supporting shore bombardments for Allied naval landings, moving north to support the occupation of the island of Morotai, one of the northernmost islands of the Dutch East Indies. Following this, she moved further north as the Allied Pacific fleets closed in on the Philippines. Joining the massive Leyte invasion force, she took part in her last naval battle on 25 October 1944: the Battle of Surigao Strait, during which a gargantuan Allied naval fleet surrounded and destroyed the seven-ship Japanese ‘Southern Force’ during the Battle of Leyte Gulf. She continued to support Allied naval landings until early May 1945, having sailed around almost every major island of the Philippines by this point. From the 3 to 16 June, she carried General Douglas MacArthur on a tour of Borneo and the central-southern Philippines, returning to San Pedro, California on 7 July 1945, where she would remain until October. That fall she sailed to New York, and remained there until she was decommissioned on 1 July 1946. Boise sat idle in New York until 11 January 1951, when she — alongside her sister USS Phoenix (CL-46) — were sold to Argentina. She was re-named ARA Nueve de Julio, in honor of the date of Argentine independence. Her only major action was during the Revolución Libertadora, a civilian and military uprising which overthrew the democratic government and replaced it with a military dictatorship. Nueve de Julio — in support of the democratic government — shelled oil depots and military facilities along the southern shorelines of Argentina. She remained in active service until 1971, and she was moored at the main Argentinian naval base — Puerto Belgrano — for her last years. By the mid 1970’s, the rat-infested ship had been largely abandoned and had notably decayed. She was struck on 31 October 1977 and sold for scrap on 28 June 1981. She was slated to return to Brownsville, Texas in order to undergo conversion into a museum ship, but instead she was towed to Japan and scrapped in 1983. Her surviving sister, ARA General Belgrano, was sunk on 2 May 1982 during the Falkwands War between Argentina and the United Kingdom. Boise was never painted in Measure 32 camouflage. Early Measure 1 paint scheme is missing. Colours consisted of Dark Gray (5-D) overall with Light Gray (5-L) structures above the stack tops. Boise was repainted in this scheme towards the end of World War II. Mid to late war Measure 22 paint scheme is also missing. USS Boise (CL-47) during sea trials, 7 July 1938. Boise’s gunfire damage diagram from 11-12 October 1942 off Savo Island. A sailor points out details of the Japanese trophy flags painted on Boise’s pilothouse as a scoreboard of enemy ships claimed sunk in the Battle of Cape Esperance, 11-12 October 1942. Boise fires on enemy forces near Gela, Sicily, 11 July 1943. Photo taken from aboard LST-325. Boise shelling the coast of New Guinea, 10 February 1944. Boise arrives in New York Harbor on 20 October 1945, to participate in the Navy Day Fleet Review. The south end of Manhattan Island is in the background. The ship's bell of USS Boise was saved whilst she was being scrapped, and is on display at the Idaho Military History Museum in Boise, Idaho. This page was last modified on 19 February 2019, at 08:44. This page has been accessed 39,482 times.